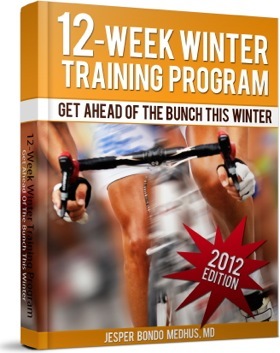 The book is available currently from http://www.training4cyclists.com/12-week-winter-training-program/ priced $29.95. I asked myself before reading this book “why would the Author want to write 12-week winter training program book”. Without much though my answer was to provide direction, structure and purpose to the cyclists winter training in order to see rewards in the spring/summer. The book is written by an MD without the MD language. The descriptions, detailing and layouts are easy to understand and provide brief and sufficient information to complete the 12-week winter training program in a professional and confident manner. The book starts of by detailing how last year’s season should be evaluated and how lessons can be learned and implemented for the coming season. Motivational and personal scheduling skills and techniques are also discussed. The author discusses the indoor and outdoor cycling approaches along with the benefits of the ergometer for power measuring. Prior to the actual 12-week winter training program the author provides the reader with enough information to prepare and structure their schedules/lives in order to improve their training volume from 4 hours per week to 10 or more hours per week. As for the actual workouts themselves the author details out the intensities and how to get the correct values from testing protocols (which the author also explains). Intensities such as Threshold and VO2 max are explained with their impact on the body described. The actual 12-week winter training program and the 12-week winter training (weights) program are laid out in a very easy to read fashion. Each week (numbered 1 – 12) is laid out in individual days (1-7) in a table format with the days prescribed workout in a box of its own. Each week also has a narrative with it, explaining what the individual sessions are and what is trying to be achieved with the session. How to complete the prescribed workouts is also discussed. Couldn’t be any easier!. This book is not a detailed in-depth description of physiological responses to training or has it any power to weight ratios or fancy charts to baffle the individual rider. Rather it is a concise book which will bring the casual or recently committed rider from his first or second year racing to the next level. It will provide all the tools needed for riders with basic or even no knowledge to structure their cycling, stay focused and move on to the next level of competition. I’ve also asked myself the question of whether the book would improve more advanced riders. After some deliberation I’ve come to the conclusion that some of the more talented riders would gain more from the direction provided by the author. When one looks at 1st Cat riders year in year out competing at the same level and making the same mistakes over the last 5 – 10 years maybe the could sit down with a good book like this and educate themselves as to how to structure their winter time to produce solid and beneficial results. Our final note before the authors last word is that this book is well laid out, provides the relevant detailed information for a rider from 4th through to 1st Cat, to structure and develop themselves and their commitment to training and racing into a productive and professional system. We would recommend this book to all levels of cyclists. Enjoy the miles! This entry was posted in Reviews and tagged 12 Week Winter Training Program, Cycling, Cycling Endurance exercise engineering Fatigue Profiling Heart Rate Monthly Testing Protocol Orthostatic Heart Rates Power sports and exercise engineering sports engineering Sports Exercise Engineerin, Endurance, Fatigue Profiling, Heart Rate, Indoor Cycling, Max Power, Monthly Testing Protocol, Power, spinning classes, Sports Exercise Engineering, SRM, Test Protocol, winter program. Bookmark the permalink.